Leon a GSD Cross, was orginally brought over from Spain and adopted by a couple who had another dog. Sadly Leon has become more and more dominant both to the other dog in the household and indeed to the lady owner. They have tried local behaviorists and dog training classes but so far they havent got the measure of this lad. He is only 16 months old, neutered and fully passported. Basically Leon needs to be taken back to basics and start from scratch with pack leadership training and socialisation. 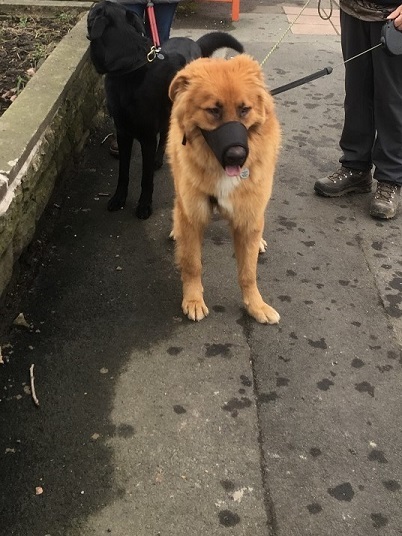 He was vocal and muzzled when our volunteer entered the premises, the muzzle was taken off and Leon immediately tried to jump on the settee to sit next to our volunteer, he was quickly told off and skulked away and didnt bother the volunteer from then on. Outside he is quite strong on the lead and will be vocal to other dogs and strangers. All in all a youngster that has taken upon himself to be in charge, especially of his female owner. He needs to find a confident owner asap.